Economic data reveals BDS harms Palestinian Arabs, detrimental to PA economy. Economic data has recently revealed not only the extent of Palestinian Arab employment in the joint industrial zones in Judea and Samaria, but also the economic harm the boycott movement is causing Palestinians. In a special pavilion which opened on Sunday at Deutscher Israelkongress, the largest European pro-Israel conference with over 3,000 people in attendance, Minister of Strategic Affairs Gilad Erdan (Likud) and the Mayor of the Jordan Valley Regional Council David Elhayani presented data revealing that coexistence between Israelis and Palestinians is the best and most beneficial solution for all sides in the region. According to data from Israel’s Civil Administration some 25,000 workers, 18,000 of which are Palestinian Arabs, are employed in the joint economic zones located within Judea and Samaria. The Palestinian Central Bureau of Statistics also cites that Palestinians working in Israeli jobs account for 11.7% of the Arab workforce in Judea and Samaria in 2014, and their total salaries in Judea and Samaria in 2013 made up 12.3% of the GDP of the entire Palestinian Authority (PA). The data highlights the fallacies of boycott activists’ actions against factories in Judea, Samaria and in the Jordan Valley directly and significantly affect the economic wellbeing of both Palestinians and the Palestinian economy. According to the Palestinian Central Bureau of Statistics, in 2015 the wages of Palestinians working in Israel were significantly higher than the salaries of Palestinians employed in the PA. The average daily wage of Palestinians working for Israelis was 187.5 shekels, twice the daily average wage of 90.9 shekels. In comparison to Gaza, Palestinians who worked in Judea, Samaria, the Jordan Valley, and the joint industrial zones earned three times more than their compatriots in the Gaza Strip, who earn 63.9 shekels on average a day. In examining the average hourly wage (assuming that the working week is 6 days), Palestinians earn in Israel 29.5 shekels, compared to only 12.49 shekels in the PA and 11.7 shekels in the Gaza Strip. Among Palestinian workers in Israel, wages of workers in construction, transportation, storage and communications industries are the highest (average daily wage of 220.9 shekels and 209.8 shekels, respectively). In the PA, the industries with the highest average daily wage are transportation, storage and communications, as well as the service industry (114.1 shekels and 106.9 shekels, respectively). In the Gaza Strip the most lucrative industries are services (82.7 shekels), as well as construction (33.5 shekels). The Boycott, Divestment and Sanctions (BDS) movement’s boycott against the farmers of the Jordan Valley has caused significant damage for them and their families. According to figures presented by the Mayor of the Jordan Valley Regional Council, David Elhayani, the livelihood for thousands of Jewish and Palestinian families in the area has been devastated. The export of peppers from the Jordan Valley also suffered a serious blow following BDS activity in Europe. Farmers in the Jordan Valley were forced to divert pepper exports from Western Europe to Russia and Eastern Europe, where prices are 50 to 30 percent lower. This dramatic drop meant that farmers of the Jordan Valley, both Jewish and Palestinian alike, saw a significant reduction in their income, with an estimated total loss of 100 million shekels. 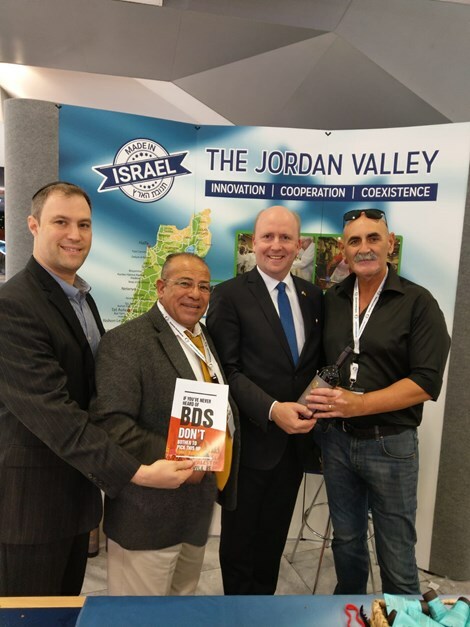 BDS’s impact on agricultural exports from the Jordan Valley stems from several reasons. Private supermarket chains in Europe are no longer purchasing products from the region, there is a requirement for marking any produce from beyond the Green Line with the exact place of its cultivation, and the EU has issued a regulation that no longer permits crop protection and inspection services to issue “Inspection Certificates” for local produce. 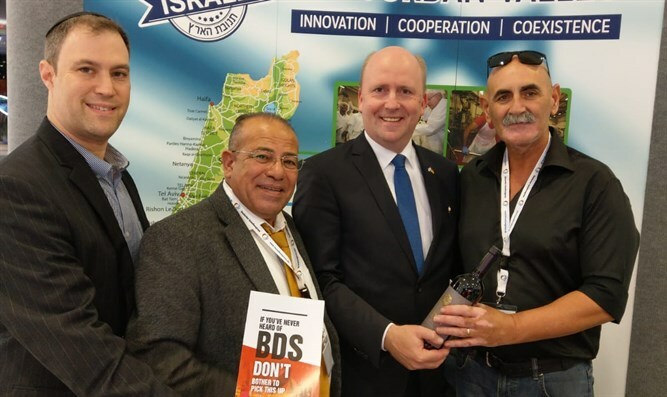 As a result of the damage to agriculture in the Jordan Valley, Minister Gilad Erdan’s Ministry of Strategic Affairs, which is responsible for combatting BDS, initiated a joint project with the Jordan Valley Council to assist the farmers in the region. As part of the project, pavilions consisting of the region’s produce (including boycotted products) are being showcased at conferences around the world while emphasizing the importance of coexistence and benefits of a shared economy. Erdan said that he is proud to present the agricultural produce of the Jordan Valley to Europe, and that the key to peace in the region is the continued economic development of the Jordan Valley, Judea and Samaria. "In this region both Jews and Palestinians live and work together in harmony. It’s important for our friends in Europe to realize that the key to peace, stability and good neighborly relations between nations begins with economic development, especially in the joint industrial zones. Furthermore, the European continent has already suffered the effects of the ill-fated boycotts against Jewish products, and therefore should be wary and resist anti-Semitic actions of the BDS movement," he pointed out.